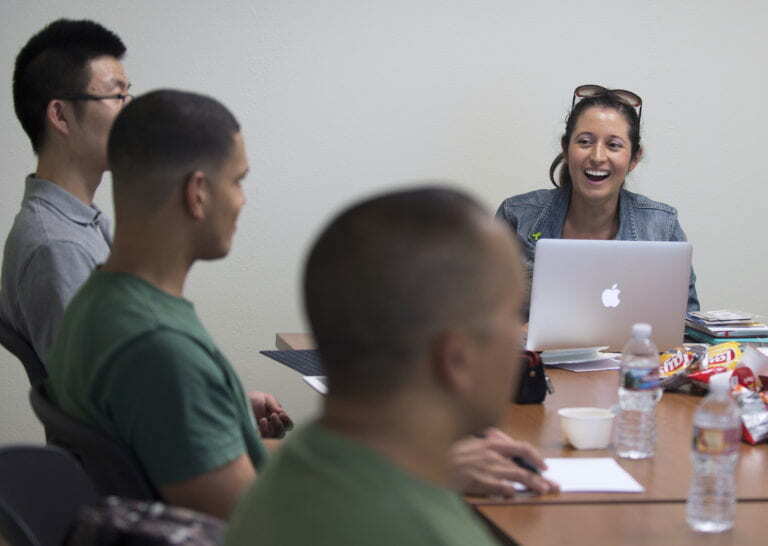 The UCI Veteran Services Center supports a diverse group of current and former military personnel and their dependents with a host of programs to help with tuition and housing, the transition to student life, comradery and career readiness. UCI is recognized nationally as a strong institution for service members, earning a rank of No. 16 on U.S. News & World Report’s 2018 list of the best colleges for veterans. In a recent interview, director Adeli Duron discussed the history and mission of the Veteran Services Center and highlighted some of the activities planned for the upcoming Veterans Appreciation Week, Nov. 6-10. Q: When was UCI’s Veteran Services Center created? A: The Veteran Services Office existed for many years for the sole purpose of processing GI Bill benefits for veterans and dependents, but it was always a shared space administered by a staff member wearing multiple hats. I started the position in 2006, and it was a dual role at the time. The need for a dedicated veterans’ center on campus began to grow significantly after the post-9/11 GI Bill was enacted in 2008. There was a huge jump between 2010 and 2012 from about 40 veteran students to about 200, a population that has been fairly stable for the past few years. During the early 2011 term, they advocated for a new space that was solely theirs, and the vice chancellor of Student Affairs committed to making that happen. In September 2011, the new Veteran Services Center opened, and my position eventually evolved to 100 percent serving veteran students. Q: Can you describe the community you serve? A: Of the undergraduate veteran population, 98 percent are transfer students. There’s a very small percentage that come in as freshmen. The total of about 200 veterans includes graduate and undergraduate students. Most of them are in The Paul Merage School of Business, The Henry Samueli School of Engineering and the Donald Bren School of Information & Computer Sciences, with some in the School of Law. The military offers a lot of opportunities to develop administrative and technical skills, so naturally our veterans gravitate toward those schools. But we help more than veterans; we also help military dependents, so really the total population we serve on campus is about 800 people. Q: What services does your center provide? A: The program we administer that touches the most people is the CalVet College Fee Waiver; there are more than 450 students taking advantage of that benefit. Eliminating tuition and some student fees, it goes to those who are the offspring of active military and veterans with a disability rating – even if it’s 0 – and who make less than $13,000 a year. Federal GI Bill benefits are handled through our office as well. These include the post-9/11 GI Bill, Montgomery GI Bill-Selected Reserve and Dependents’ Educational Assistance Program. Each provides veterans, reservists or dependents financial assistance to complete their education. The Veterans Access, Choice & Accountability Act, which we also administer, waives the out-of-state tuition costs for veterans. It originally only applied to retired military but was recently opened to both retired and active-duty service members who are using post-9/11 GI Bill or Montgomery GI Bill education benefits (or have transferred them to their dependents). Even if those benefits expire while they’re in school, they can still take advantage of the VACA Act until they finish. Q: Does your center offer anything other than financial aid programs? A: UCI is unique in that it has guaranteed housing for veterans and their families. Most of our veterans are over the age of 25, so you can’t place them in housing with the younger students, plus many of them have families. The program takes into account that some may be deployed or need to move out for a period of time. Ordinary students would lose housing if they weren’t actually occupying the space, but we guarantee that our veterans can keep their housing as long as they continue paying. This helps them keep their children in the same school while they’re deployed or away for training. We’ve heard, anecdotally, that service members and their families really like this benefit a lot. It has helped build a military and veteran community in Verano Place and Palo Verde housing. Having neighbors who understand your situation is very helpful. A: Do you help veterans with school and career choices? Q: Yes, we offer a “Veterans in Higher Education” class to help transitioning students acclimate to UCI. We meet once a week and have guest speakers share info about campus resources, opportunities to get involved outside the classroom, undergraduate research options and study-abroad programs. We also assist in building resumes, creating LinkedIn pages and preparing for job interviews. Q: Do you have anything planned for Veterans Day? A: We have a whole range of activities planned for Veterans Appreciation Week. On Monday, Nov. 6, from 9 to 10 a.m., we’re offering a hot breakfast here in our space in the Student Center, compliments of Aramark. 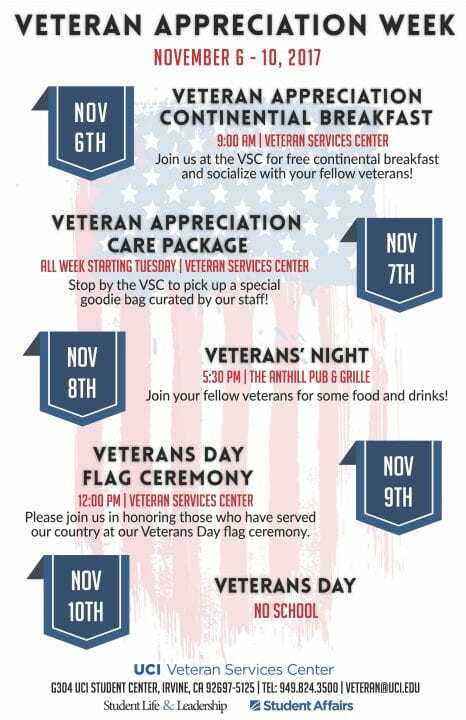 On Tuesday, we’re going to have goodie-bag care packages with granola bars, pens, pencils, erasers and test materials for any veterans who want to come by. On Wednesday at 5 p.m., we’re having Veteran’s Night at the Anthill Pub & Grille in the Student Center. Thursday is our annual flag ceremony, which is our flagship event. It will be at the flagpoles – or Admin Loop, as some people call it. Friday is our day off on campus in observance of Veterans Day, which is Saturday, Nov. 11. There’s a big community event that day at the Orange County Fairgrounds; we’re doing some promotions to get our students to go to that.